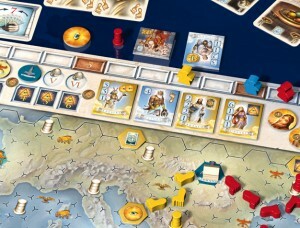 Pantheon is by the same designer as Stone Age which is one of my favourite boardgames. I read through the rules recently and it’s definitely one I want to try out. As the name suggests, the theme involves the Gods. The game’s played over 6 turns (epochs) and each turn one of the nations on the board is activated which means loot tiles are placed on hexes with that nation’s symbol, that nation’s special effect is executed and some god tiles are revealed. 1. Move – Spend cards to place their coloured pieces on the board; thereby, claiming hexes in chains across the board which in turn can gain loot tiles.